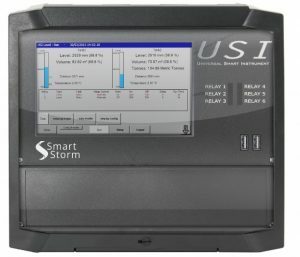 The USM is a powerful level monitor and controller ideal for cost effective solutions. Using a smart ultrasonic sensor, the USM will measure up to 20m in liquids and 10m in solids. With all standard tank shapes available in the look-up menu and non-standard tanks programmable through a multipoint input table the USM will meet all your level and volume measurement requirements. Simple pump control is available through the programmable relays and with a 4-20mA output and a RS485 (Modbus) output the USM can readily communicate with other instruments. Ultrasonic level monitoring often suffers from erroneous results due to false echoes from artefacts inside tanks and silos. The USM echo profile map can be accessed through a pc connected to the RS485 interface and false echoes simply removed from the profile allowing accurate and reliable level and volume measurement. 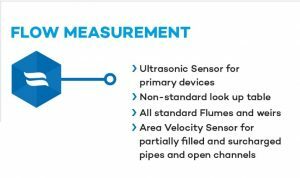 The USM coupled with either a Digison ultrasonic airborne sensor for flumes and weirs or a Digison area velocity sensor for open channels, irrigation channels or pipes, offers a low cost option for water and waste water flow measurement. All ISO type flumes and weirs are preprogramed into the USM for primary structures and for non-standard devices a 21-point look-up table is programmable. A Manning formula for numerous pre-programmed channel shapes and pipes allows simple set-up for area-velocity measurement. The USM measures a wide range of environmental parameter and as standard the USM will measure pH or redox plus one of the other variables, conductivity, DO and Turbidity. Conductivity, and Turbidity. All sensors incorporate an in-built temperature sensor so temperature is a no cost added value input. Sensor can be either free mounted in tanks or channels or inserted into pipes using Smart Storms bespoke pipe brackets. Additional to the USM environmental USM is an optional data logger which will record in excess of 22 years of data. A windows based reporting software package allows the user to download data using a USB port and display and print graphs and detailed reports.